Do you follow McCall Pattern Company on Instagram? If not, you should, Meg does the best job inspiring me. 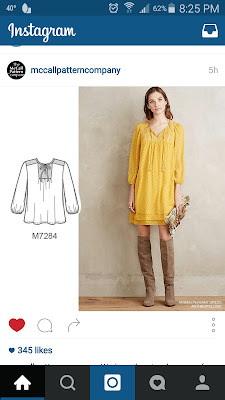 Quite frequently, Meg posts a RTW picture and a pattern suggestion, which I love. Friday Fashion, Inspiration, right? My problem is I know I cannot remember all the inspirations and pattern numbers, so I screenshot the Instagram picture. I can reference that screenshot anytime on my phone. 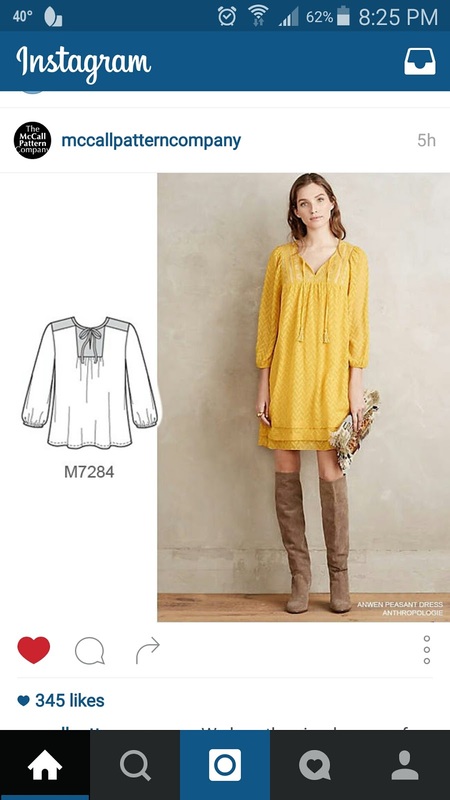 That is how I selected, McCall's 7284, from this Instagram photo. Isn't that a cute dress? I went with this Mood Fabrics' Cotton Voile and it sews and presses beautifully. I cut the front and back from what is the border print, squeezed the front yoke and back yoke from the solid navy along one selvage and used the rest for the sleeves. I used View A with no ties, slimmed the sleeves and added the curved hem. I tried my top and the straight hem did not do much for the look, so I shortened it by a bit and used the pattern for View D to curve the sides. I interfaced the front yoke with a tricot interfacing, since I was not adding the ties, I didn't want the yoke to fall forward. I thought I would like my top but I had no idea how much I love this top, the fit is good, the style is boho and the fabric if fun. It is a trifecta for the win! What a fun top, and your hair is adorable as usual!! Oh, thanks so much Kyle and Judith. I have worked hard getting my hair healthy again and styling hair is not a strong point for me. It has taken work and lots of direction from my daughters. I appreciate all you nice comments, thanks so much. Very nice top. It looks very comfortable. Love this top and the fun fabric. I like how there is an Ombre effect of polka dots. Thanks, Tomasa, it is great fabric and fun to work with. Cute, cute, cute! 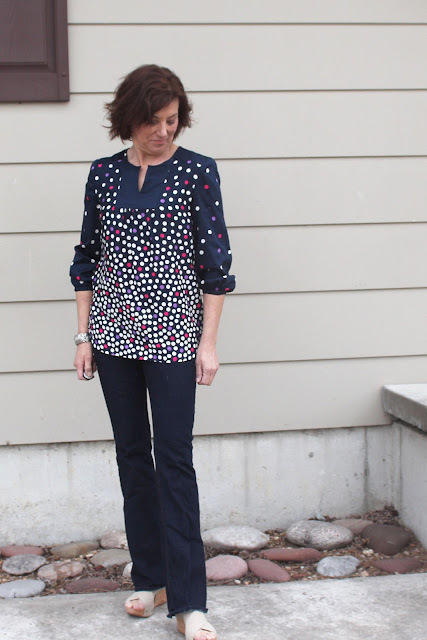 Perfect spring top! Wow -- the fabric makes it! Great fit and thanks for sharing the wonderful final result! Thanks, Pam, I love the fit, not too oversized at all. Such an elegant outfit and great use of that border print. Thanks, Manju, I love this one - that is for sure. Thanks, Beth, it was fun to plan out how to use the print. 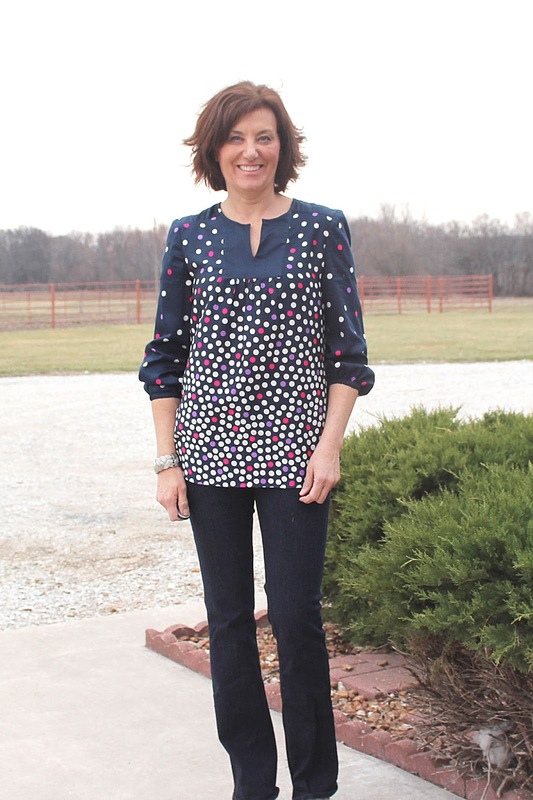 Love the pattern, top, and fabric choice! Thanks, Dorothy, it is a winner, I think. OMG. That is very cute! This is a definite wow! I don't know if I will be able to resist buying this fabric. Thank you, Anna, did you buy the fabric? I love the fabric! What a beautiful top, and it suits you so well. Thanks, I do love it. I saw that dress on Instagram as well and quickly forgot where I saw it. I did however manage to find the pattern and bought it. I love your top and it is exactly how I imagined making this up. You have inspired me! Thanks, and isn't it fun when the plan comes together perfectly? You have used the border print to great effect. This is a very pretty top. Thanks, Jean, it was a fun fabric to use. Thank you, Lori! I get such satisfaction when I read things like this. Make it all worthwhile. And then to see your fabulous results!!! Well done. Thank you, Meg, all you hard work is greatly appreciated. You can take credit for all of us looking so good! This is fantastic! That print is divine and the pattern has been on my must make list for weeks now! Thanks, Sarah, you have to make this one, it is a such a winner. 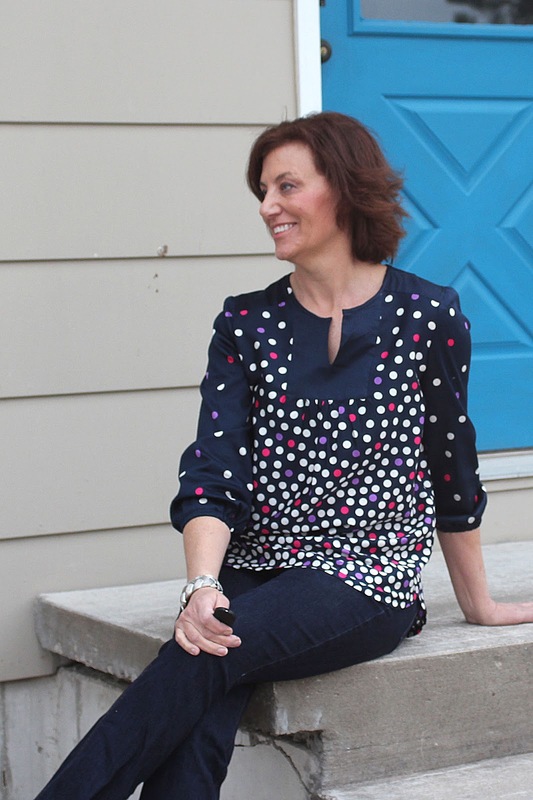 I have this pattern, and you've inspired me to make it for Spring - this polka dot version is so delightful and fun and cheery! You are right, it is the perfect fit - thanks for the tips on the small changes you made - it looks wonderful.